Slovenian President says he will only back recognition of Palestinian state if it contributes to solution of conflict with Israel. Slovenia's president cast doubt on Friday on his country recognizing “Palestine” as a state in the near future, days after the foreign minister had talked up the chances of such a move. 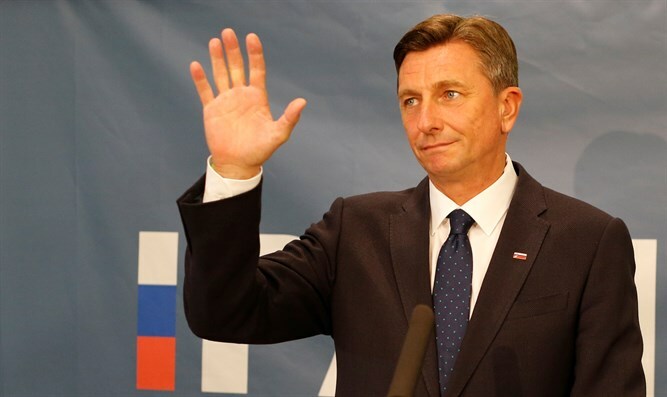 President Borut Pahor's office said in a statement to AFP that he would only back the recognition of a Palestinian state "in circumstances that would contribute to the solution of its bilateral issues with Israel but not to the worsening of relations". The statement added that for the moment, "those circumstances (contributing to a solution) are not in place". Foreign Minister Karl Erjavec had said on Monday he hoped Slovenia would officially recognize a state of “Palestine” in March or April and that this would "strengthen Palestine's negotiation in the Middle East peace process". Erjavec's comments came a day after senior officials in Jerusalem told Israel’s Channel 10 News that Slovenia is expected to recognize the “state of Palestine” in the coming weeks and that three other European countries are considering the same move. Slovenia would be only the second of the EU's 28 member states to recognize Palestine while a member of the EU. Sweden did so in 2014. Eight other countries took the step before entering the EU: Poland, the Czech Republic, Slovakia, Hungary, Bulgaria, Romania, Malta and Cyprus. Earlier this week, Palestinian Authority (PA) chairman Mahmoud Abbas met EU foreign ministers in Brussels and asked them to recognize a Palestinian state on the pre-1967 territories with eastern Jerusalem as its capital. While several European countries have in recent years recognized the state of “Palestine”, these were symbolic moves that have little, if any, actual diplomatic effect.